Adult brown marmorated stink bug with egg cluster on a maple leaf. You probably have seen the brown marmorated stink bug (BMSB for short) coming into your home or shed to find shelter from the winter cold. This pest arrived in the United States in 1996 and is now in 43 states. BMSB was first detected in Oregon in 2004 and Washington in 2010, and is steadily becoming more abundant across the Pacific Northwest. These pests are problematic because they can feed on around 200 different plant species, including many ornamentals such as crabapple, maple, lilac, hawthorn, and cherry. While they often feed on fruits, they also enjoy leaves, stems, and even bark. Their feeding results in spotted and disfigured fruits, sap flow in bark, and plant death in extreme cases. Nursery growers have noticed BMSB on the shoot tips of young seedlings in the early spring and fall. Naturally, they were concerned about damage inflicted by BMSB, but there was no information on how they might affect the vegetative growth of non-fruiting nursery crops. We only knew that these pests preferred to go to nursery plants with fruits, and damaged fruits. Therefore, we designed two studies to examine whether adult BMSB would affect the physical growth of mature plants and seedling. The studies exposed plants to BMSB adults for one or two months because the insects will stay on these plants briefly before they move to other preferred plants or seek winter shelter. Figure 1: The average (± standard error) for the different plant growth measurements taken from branches of mature crabapple trees. 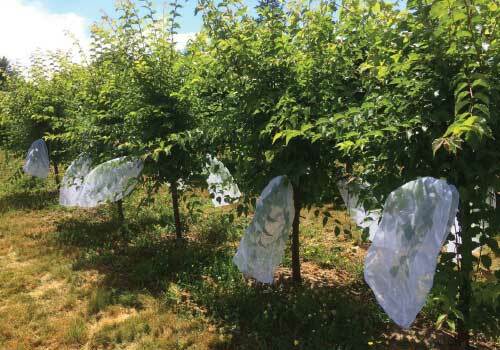 Mature elm trees in the nursery with branches in large mesh bags. Do BMSB on shoots of mature trees impact growth? We examined six common nursery species in a stock block of a nursery: silver linden, hawthorn, maple, crabapple cherry, and elm. To evaluate potential damage, we placed either three pairs of adult BMSB or no BMSB (control) on a cluster of branches caged in a large mesh bag in early June 2016. Each tree had a BMSB and control bag. Only water was provided so that BMSB fed on stems or leaves within the mesh bag. After a month, all the branches were taken back to the lab for processing. 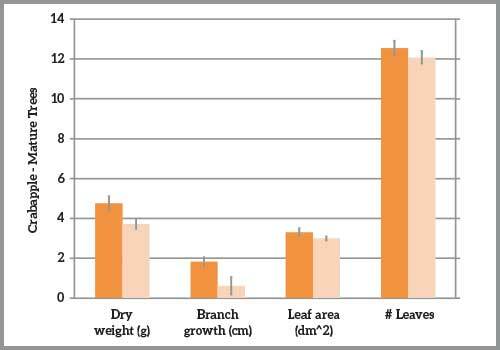 We measured the change in branch length, leaf area, number of leaves, and dry weight (see Skillman and Lee 2017 for additional details on methods). 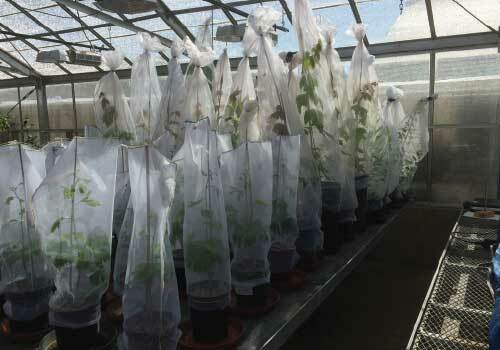 Overall, there were no significant differences between branches caged with and without BMSB for one month in the nursery for the four plant growth measurements taken. For example, crabapple plant growth was slightly higher, though not statistically significant, in the presence of BMSB (Figure 1). The lack of an effect is not surprising for large established trees; the trees might tolerate short-term insect feeding on a few branches, or even overcompensate in growth. Nursery seedlings in large mesh bags in the greenhouse. Do BMSB on seedlings impact growth? We measured the impact of BMSB on seedlings of the same six plants as in the field trial above as well as lilac and ginkgo. Bare root seedlings of eight common nursery plant species were planted in pots in early May, and we started the experiment in late June once seedlings had rooted and leafed out. Seedlings either received two pairs of adult BMSB or none (control) and were fully enclosed in a mesh bag and maintained in a greenhouse. The same four plant growth measurements from the field study were taken on each branch of the seedling with an additional measurement of change in stem diameter. Half of the seedlings were measured one month later, and the rest were measured after two months. Again, there were no significant differences between seedlings with BMSB or control treatments for all five plant growth measurements. This might to due to seedlings growing quickly during summer and possibly outpacing any damage inflicted by BMSB presence. Note the healthy vigorous hawthorn seedling after two months with BMSB treatment. 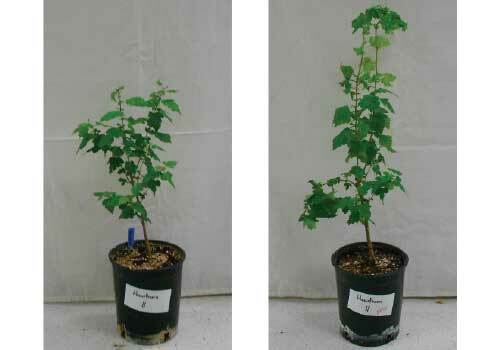 Photo comparison between starting and two month hawthorn exposed to BMSB treatment. In both the field and seedling trials, we observed confined BMSB to lay eggs on the plants and sometimes nymphs walking on plants. So while BMSB may not substantially affect plant growth, it could be a contaminant. Overall, the presence of adult BMSB on branches of well-established nursery plants during early summer and newly planted seedlings had little to no impact on growth in one or two months. These results might suggest that these plants are growing fast enough during the summer to outpace potential damage, or that BMSB do not feed sufficiently on the leaves and stems to inhibit growth. While short-term impacts on plant growth do not appear problematic, other concerns with BMSB in nurseries selling non-fruiting crop should be further examined. Does BMSB feeding make plants more vulnerable to pathogens? Are plants likely contaminated with BMSB eggs, nymphs, or adults? Since nurseries may contain patches of ornamentals bearing fruits and are often surrounded by other preferred crops, BMSB are expected to move through nurseries. Victoria Skillman was a master’s student at Oregon State University and is now working at the Oregon State University Hermiston Agricultural Research & Extension Center. She can be reached at skillmav@oregonstate.edu. Jana Lee is an entomologist at the USDA-ARS Horticulture Crops Research Unit, and studies pests of ornamentals and small fruits. The authors wish to thank Colleen Corrigan, Michael Flores, Kathleen Knight, Eric McDougal, and Anne Snell for assistance processing samples, and the nursery for plant material. Funding was provided by a nursery grant, USDA NIFA SCRI grant 2011-51181-39037, and base funds USDA 2072-2-222000-040-00D. References: Skillman, V.P. and Lee, J.C. 2017. 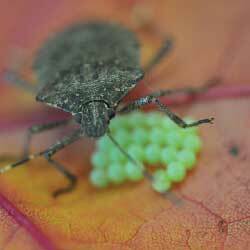 Evaluating Impacts of Brown Marmorated Stink Bug on Non-fruiting Nursery Crops. Journal of Environmental Horticulture, in press.